Sweaters, pumpkin spice, boots and goblins. What more could you need? Fall is a gorgeous time of year that lends itself to so many fun family activities. From Thanksgiving celebrations to the spooky good times of Halloween, there is so much you can enjoy with your family, indoors and out. A trip to the pumpkin patch is a super afternoon treat: many farms have wagon rides, apple picking, hot cider to taste and more! Just pick a sunny day and off you go! Most pumpkins can be bought and stored for up to 60 days, so when you bring home your selection, just store them in a cool, dark place until you’re ready to carve. Get carving! There are some great carving ideas on YouTube but here are the basics: Draw your design on the pumpkin with a black marker, cut off the stem top, and scoop out the insides into a bowl. Now you’re ready to carve out your design and add your candles or battery operated LED lights. Carve the stem lid at an angle, so that the top doesn’t drop right into the pumpkin when you try and put it back on. Scoop out the insides but pay particular attention to the side where you plan to carve: if you make it thinner from the inside, it will be easier to carve afterwards. Sprinkle cinnamon on the stem lid if you’re using real candles inside. When you put it on and light the candles, your whole porch will smell delicious: just like fresh baked pumpkin pie! Painting pumpkins can be fun too and if you’re handing out allergy-proof treats, don’t forget to paint one pumpkin teal so that your friends and neighbours with food allergies know it’s safe to trick or treat at your house! Pick out and roast your pumpkin seeds! They make a great snack! It’s easy too: just preheat your oven to 300 degrees, toss the seeds in two teaspoons of melted butter, spread one layer onto a cookie sheet and sprinkle with some salt before popping them into your oven for about 45 minutes, with the occasional toss of the seeds, so you can get an even roast. What else can you do to make Halloween awesome? Decorate the house, inside and out! Spider webs, bats, crows, a fake cemetery… you can go to town at this time of year with crazy, silly decorations that are just plain fun. It doesn’t have to cost a fortune: Halloween decorations just require a little imagination. Look online for harvest fairs happening near you: nothing says day trip like a Fall harvest fair, complete with candy apples and a corn maze! A trip to the countryside is a great way to celebrate the bounty of the autumn season. Watch for scarecrows as you go! Get your baking on and whip up a batch of pumpkin pie cupcakes or maybe go a little decadent and try a white chocolate pumpkin cheesecake. Yum! While there’s a lot of candy and sweets floating around at this time of year, an extra cupcake or two won’t hurt! Stay close to home and rake up all the fallen leaves into the biggest pile possible and before you bag them up, jump in! Make sure you have your camera ready for that one! Don’t forget to save a few of the best leaves for a Halloween craft or decoration. When you’re picking out costumes or deciding what everyone is going to be, don’t forget your pets! Nothing says adorable like a guinea pig in a Harry Potter costume! That will be a family photo no one will forget! Cool nights are the perfect time for a fire in the fireplace, a few ghost stories or a scary movie! Halloween crafts are another great way to spend an evening too, with the advantage that the results will take your indoor and outdoor decorations up a notch! It doesn’t have to be complicated: felt bats on pieces of fishing line are just as spooky when they’re floating around as any store bought item you could ever find! Do you have Halloween traditions that your family does, year in and year out? Share them with us! We’d love to read about more! I have gotten my pumpkins, and already decorated the house. We love Halloween at our house and the kids love watching their Halloween movies. 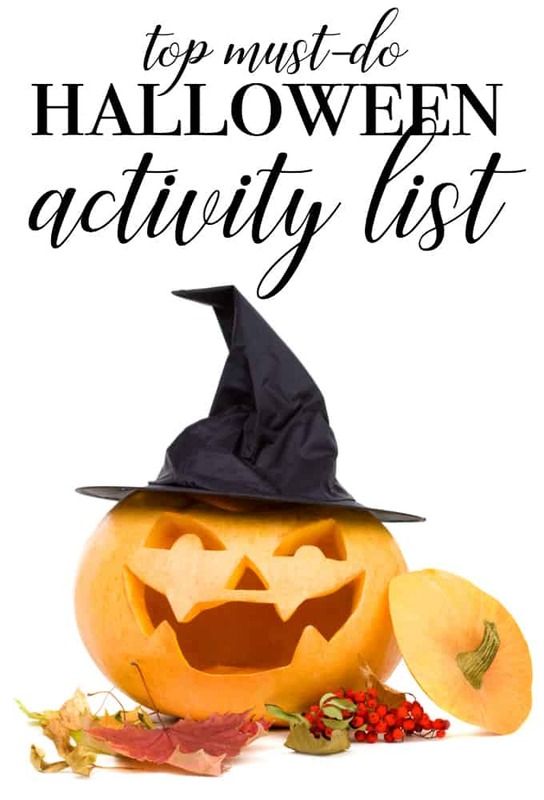 These are all definitely halloween must do’s. We love to go to the pumpkin patch that has a petting zoo and fresh made pumpkin doughnuts. We were going to go this am… but I threw my back out making the bed… ugh. No pumpkin patch for today, sadness. I love your tips, but sorry just can’t dress up the dog. I just can’t do it. I’m going to the Pumpkin Festival next Saturday. It’s pick your own and they have a lot of neat pumpkins. Thank you for the tips I love pumpkin seeds but have never roasted them myself but will now try them. I haven’t roasted pumpkin seeds in ages! Until next halloween!! 🙂 Will keep these in mind.